The Victorian Liberal Party has moved three amendments to the Firearms Amendment Bill which are likely to be voted this week, possibly as early as Tuesday. Unfortunately Labor has taken this news badly, and fired off a terse media release which is aimed at the Liberals. What it may not appreciate is that it is also attacking the integrity and legitimate concerns of the shooting community. You may recall the Bill seeks to introduce “Firearm Prohibition Orders” which would enable the Chief Commissioner of Police to impose significant restrictions on people from owning or possessing firearms, or even visit places where firearms are stored. The Orders were sold to parliament as targeting criminal and terrorist activities, however the Bill does not use those words, and leaves it open for the power to issue orders to be abused for other reasons, such as for political activities. The CFCV’s President and executive members have had several meetings with a number of Upper House MPs to try and secure the numbers necessary to seek amendments to the Bill. There was no chance that the coalition would oppose the Bill – as it would not want to be seen opposing anything which targets criminal activities – but accepted our argument that the Bill, as it is worded, does not reflect what was intended. In it’s last sitting week, the Liberal’s Edward O’Donohue, moved three amendments which go quite a fair way to what we were seeking. If the other upper house MPs who said they would support our position hold true, then there is a chance these amendments will get up. Delegation: The Bill currently allows Orders to be issued by an officer down to Superintendent level The concern we have is the risk that it allows police at a relatively local level to use Orders for reasons other than criminal activities, even vexatiously. The amendment moved by the Liberals proposes that an Order can only be issued down to Assistant Commissioner level. This does not eliminate the risk, but does significantly reduce that risk. We wanted the wording of the Bill to be changed to more closely tie the reason an Order can be issued to criminal behaviour, however are happy that limiting delegation to Assistant Commissioner is a reasonable control. If these amendments get up, it’ll be a great outcome for the shooting community. Not content with eating lobsters with alleged mobsters, Liberal Leader Matthew Guy is now trying to water down laws that directly target organised crime to stop the harm they cause in our state. The Andrews Labor Government’s Firearms Amendment Bill 2017 would put in place tough new Firearm Prohibition Orders (FPO), which are designed to step up the fight against criminals who use illegal firearms to threaten, assault, murder, and destroy the lives of innocent people. The Government’s regime would give police the powers to search the premises or vehicles of anyone subject to a FPO, as well as anyone in the company of someone with an Order, without a warrant. Our amendments have been brought in at the request of Victoria Police to help them in their fight against organised crime. It’s the biggest change to police powers targeting organised crime in a generation. Organised crime, including outlaw motor cycle gangs, poses serious risks to Victoria. They are responsible for money laundering, illicit drug manufacturing, firearm trafficking, and are driving youth offending. Instead of backing our police, the Liberals are desperately trying to water down and limit these powers. The Liberal Party’s changes would reduce the duration of a Firearm Prohibition Order, limit the ability of police officers to issue an FPO, and create unworkable appeal mechanisms which only provide more opportunity for criminals to escape justice. The advice on the powers Victoria Police needed was clear. The Liberal changes significantly weaken the Firearm Prohibition Order regime and make fighting organised crime harder. The Government has been working tirelessly over the past three days to convince the Opposition of problems associated with their amendments. Despite detailed advice the Opposition have not shown any interest in compromise. Again, contrary to the Minister’s assertions, the Bill does not talk about targeting criminals (or money laundering/ illicit drug manufacturing/ firearm trafficking/ youth offending), which is the key flaw in her argument. Given the amendments to achieve this came about from the lobbying efforts of the CFCV, the Minister’s release is more than an attack on the Liberals: it’s an attack on our concerns, our logic and our intent. 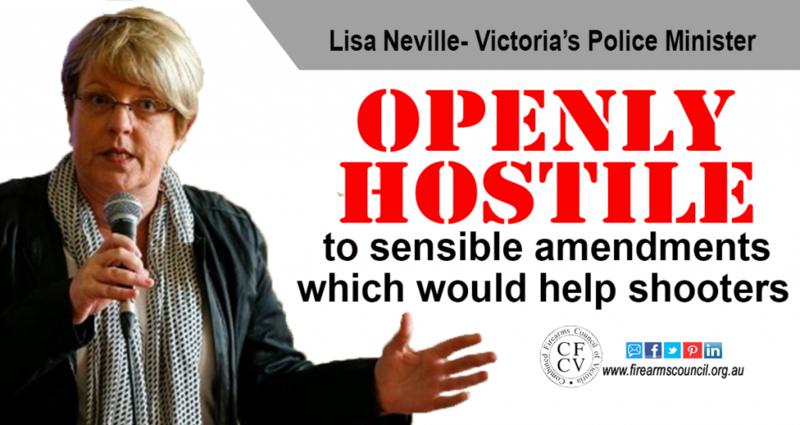 The Combined Firearms Council of Victoria has criticised Police Minister Lisa Neville for her attack on the Liberal party for moving amendments to the Firearms Amendment Bill. Last week, Liberal Upper House MP, Edward O’Donohue, moved three amendments to a proposal to enable Victoria Police to issue Firearm Prohibition Orders. The amendments sought to improve the legislation by making sure it met it’s original intention. The amendments proposed by the Liberals sought to sure the scope of the Orders focused on criminal, rather than political and other legitimate, activities. CFCV President, Bill Paterson, said the minister’s attack was political and avoided the more serious issue of preventing firearms getting into the wrong hands. “The legislation didn’t focus on criminal activities as claimed, and could have had unintended consequences such as prohibiting farmers from visiting the homes of their neighbours,” he said. “The reason the Bill is in the state it is in, is because the government tried to rush it through and didn’t consult anyone on it”. “We are disappointed that the Victorian Labor Government did not consult with shooting groups, the Victorian Bar Council or civil liberties groups before pushing this legislation through”, Mr Paterson said. He said the amendments now being criticised by Minister Neville were supported by the CFCV, and that the attack on the Liberals was actually an attack on Victoria’s shooting organisations. Neither media release got a run but we felt it was important to acknowledge our support for the amendments moved by the Liberals. We’ve thanked them in private, and thank them in public. We just need the rest of the Upper House to support the amendments. Yet again, the message to Labor is that if you want to get the balance right, you need to consult. If you’d like to receive our update on the parliamentary vote, then click here to join our email list. One strange twist in this could come from our mortal enemies, the Greens. While we would never expect they will come to our rescue, the contribution by the Greens Sue Pennicuik, during the second reading debate pointed to the Greens also having concerns about the Bill (as they did in NSW) from a civil liberties perspective. Sue was switched on to the issues and we suspect took note of the briefing note we sent to all MPs when the Bill landed in the Upper House. In fact she drew specific attention to the NSW experience which is that only 2% of FPO searches turned up anything relating to firearms. We’re not going to hold our breath, but how strange would it be if the Greens voted on amendments which helped the shooting community?